February 11, 2011 - The Boeing Company on Thursday submitted its final proposal for the U.S. Air Force’s KC-X tanker competition. The proposal offers a fleet of Boeing NewGen Tankers 767-based, multi-mission aircraft that will deliver superior capabilities to U.S. warfighters and burn 24 percent less fuel than the competing European Aeronautic Defense and Space (EADS) Company’s tanker. If selected, the Boeing tanker will save taxpayers tens of billions of dollars in fuel costs over the next 40 years and support 50,000 American jobs with more than 800 suppliers in more than 40 states. “This decision is critical to America’s national security and its manufacturing base,” said Boeing Chairman, President and CEO Jim McNerney. “Our NewGen Tankers will be built using a proven low-risk, in-line manufacturing approach similar to the highly successful 737-based Navy P-8A, by an already trained and highly experienced U.S. work force at existing Boeing facilities that have delivered more than 2,000 tankers and 1,000 commercial 767s,” said Jim Albaugh, president and CEO of Boeing Commercial Airplanes. Boeing has been designing, building, modifying and supporting tankers for decades. 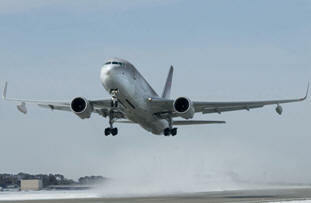 These include the KC-135 fleet, the KC-10 fleet, and four KC-767Js delivered to the Japan Air Self-Defense Force. The Italian Air Force formally accepted its first KC-767 tanker in December and will receive three more as part of its current contract. In addition to being ready now, the Boeing NewGen Tanker will continue to deliver capability and value to both warfighters and U.S. taxpayers for decades to come. The NewGen Tanker will saves taxpayers up to $36 billion in life-cycle costs compared with the competitor’s aircraft a difference that could pay for an additional fleet of 179 tankers. The aircraft features a flight control design philosophy that places aircrews in command of the entire flight envelope rather than allowing computer software to limit combat maneuverability. The Boeing 767 Tankers will provide Air Force pilots with an advanced digital flight deck featuring Boeing 787 Dreamliner electronic displays. Includes proven air refueling technology and a modernized NewGen KC-10 boom with an expanded refueling envelope capability, increased fuel offload rate and fly-by-wire control system, all from the company that invented the air refueling boom and has produced the world’s most capable and reliable tankers. Boeing’s final proposal is the culmination of a process that began when the company started studying tanker requirements after the release of the Air Force’s draft Request for Proposal (RFP) in September 2009, followed by a final RFP in February 2010. Boeing responded to the final RFP by submitting an 8,000-page proposal on July 9, 2010. A contractor will be selected early this year to replace 179 of the 400 Eisenhower-era KC-135 aircraft currently in the Air Force fleet. The German Made Flight Design CTLS Floatplane Is Now Available In The U.S.